For the second consecutive year the Hockey Hall of Fame failed to admit Pat Burns. Ostensibly, they did this because they didn't want to be accused of inducting him on account of his recent passing. This is so bogus because anyone with half a brain knows that when you have won the Jack Adams Award more times than any other coach in NHL history you're a pretty worthy selection. The Hockey Hall of Fame needs to take a look to baseball to change the way they induct their members. I've had enough of secret Stonecutters style voting. The people making these choices shouldn't be afraid to publicly state why a player should or shouldn't be admitted. This is the Hall of Fame, it's supposed to be exclusive; it isn't a Friday night fish fry. My latest post at The Good Point tackles the issue with less references to the Simpsons and fish. According to TSN, Chris Osgood’s retirement opens up another good Hall of Fame debate. In their article, they state that Osgood’s career numbers are strong: his 401 victories are tenth all-time; he recorded 50 regular season shut outs; and he won three Stanley Cups with the Red Wings (although he was only a starter for two of those teams). Well that’s nice. But unless we’re inducting those entire Red Wing teams with you, there’s no way you deserve induction into the Hall of Fame. Steven Stamkos is off the market. No need to continually refresh HockeyBuzz to find out the latest outlandish fable concerning who is soon to trade for the talented pivot. Today the Lightning signed Stamkos to a five-year deal worth $37.5 million, which works out to an average annual cap hit of $7.5 million. Some might suggest he left some money on the table, but it’s important to remember that he was an RFA and couldn’t truly maximize his value as if he was a UFA. This signing marks the first major RFA to re-sign with his club, leaving Drew Doughty, Shea Weber, Zach Parise, and Luke Schenn as the most talented players currently without a deal. It also marks an end to the various trade rumours and offer sheet speculation that happens when there is little to discuss during the summer. Stamkos wasn't presented with an offer sheet because the reality was that it was a futile venture. The Lightning possessed enough cap space to match any offer another club could have imagined extending to Stamkos. And any notion of a trade was equally ridiculous because there are no teams that would possibly consider moving a 21-year-old franchise player who has already scored 119 goals in his first three seasons. Even if the signing means the Lightning spend a disproportionate amount of money on their forwards it doesn’t matter, you find a way to shed salary elsewhere. I understand it made for a good story, but let’s be realistic, you can probably count on one hand the players you would actually trade Stamkos for. What’s really interesting about the Stamkos signing is what it means going forward. This week's post over at The Good Point can certainly be inspired by the summer heat wave currently assaulting my air conditioning-less apartment. Have you ever wondered which NHLers played inline hockey (also known as roller hockey) during the summer? Or have you ever wondered if your street hockey days made you destined for the NHL? (hint: they didn't, but inline hockey can still benefit your ice hockey game). Check out my article on inline hockey to find out. The piece also has quotes from Chris Wills, a member of Canada's IIHF World Inline Hockey Championship team in 2008 and 2009. 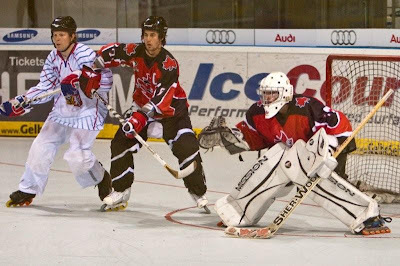 I primarily asked about the differences between inline and ice hockey and what sort of benefits playing inline can have for your ice hockey game. One quote I liked but didn't make the article, so I'll fit it in here. 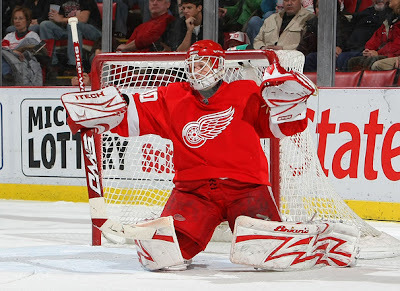 When describing some of the differences between an inline puck and a normal rubber ice hockey puck, Wills says "the [inline] puck tends to dance in the air quite a bit more and is capable of having the bottom drop out of it more frequently, handcuffing the goalie." Sounds like the knuckle puck is real. Just slightly over 17 years ago Sports Illustrated ran a cover story that proclaimed the NHL was hot, while the NBA was not. Yes, at one point hockey was cool in a mainstream way. The New York Rangers just won their first Stanley Cup in over 50 years. There were major stars in all the major American markets: Wayne Gretzky in LA, Mark Messier in New York, Mario Lemieux and Jaromir Jagr in Pittsburgh, Jeremy Roenick in Chicago, Steve Yzerman in Detroit, and Cam Neely in Boston. 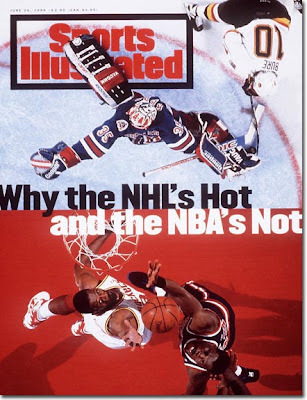 It was a good time for the NHL. It was such a good time that newly appointed commissioner Gary Bettman continued aggressively expanding the NHL into non-traditional markets. It seemed like a good idea at the time (well, as long as you weren’t Canadian and violently opposed to such things). What happened next was a decade of decline. 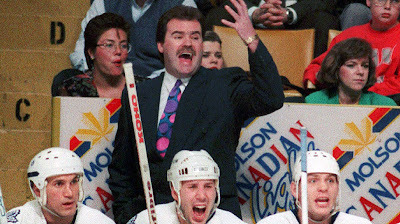 The NHL’s free agency period opened on Canada Day and GMs everywhere went mad. July 1st isn’t usually a day of tepid, reasoned action: it’s a day of all out anarchy. This year proved even more extreme than usual. Because of the increasing salary cap and a general lack of difference-makers on the market, teams were outbidding each other to throw crazy money at mediocre players. Teams like the Florida Panthers desperately needed to make the escalating cap floor and spent an inappropriate amount of money on players like Scottie Upshall and Ed Jovanovski. Not only was the amount for a former third-liner obscene, but the term given out was maddening. Max Talbot for five years? 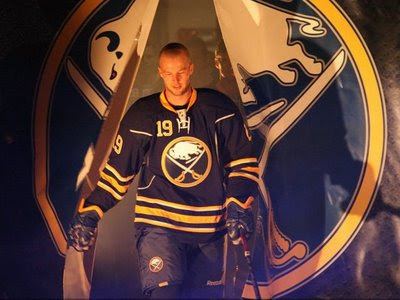 Ville Leino for six? Crazy. The Leafs wisely chose to avoid getting into a bidding war on free agents like Joel Ward and Scottie Upshall, who they likely had interest, but not for the amount players of that ilk eventually signed for. Some people in Leafs Nation were upset with Burke's inactivity, but at that likely stems from their desire to see something happen. Some tangible evidence of "progress". In reality, avoiding these deals and allowing a young player like Matt Frattin or Nazem Kadri to grab a roster spot is much more prudent. The one bidding war the Leafs did engage in was for the services of Brad Richards – the only legitimate star among this year’s crop of mediocrity.